Two boats left the Greek island of Lesbos Monday morning and arrived in Dikili in western Turkey. The EU’s border agency, Frontex, told the BBC that 131 people were on board, most from Pakistan. Another boat is expected to leave the island of Chios later Monday. A total of 202 people will be deported. “All of the migrants returned are from Pakistan except for two migrants from Syria who returned voluntarily,” Giorgos Kyritsis, a spokesman for a government refugee crisis committee, told state TV. Reporters in Turkey said officials had hung screens so the waiting media could not see those being deported. Under the deal, migrants in Greece will be sent back to Turkey if they do not apply for asylum or if their claim is rejected. For each Syrian returned to Turkey, the EU has agreed to resettle a Syrian who has been found to be a genuine refugee. 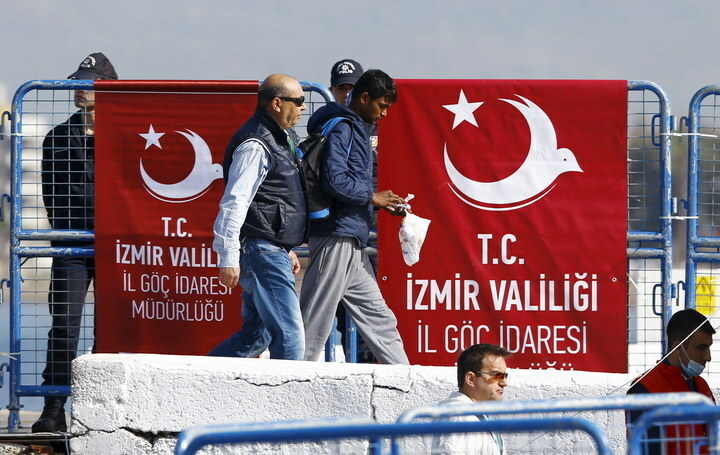 However, NGOs and charities condemned the plan, describing it as “inhumane” and “legally flawed” — and criticized the assumption Turkey was a “safe country” where refugees could wait to seek asylum. The controversial deal was struck between EU leaders and Turkey last month but logistical difficulties mean it has only just begun to be implemented. The Associated Press reported that Frontex had less than one-tenth of the staff needed to implement the plan. About 4,000 migrants and refugees have been detained on the Greek islands since the agreement came into effect March on 20.